Google announces Pixel and Pixel XL smartphones with Google Assistant. Today Google announced Pixel and Pixel XL, first phones made by Google inside and out. For those of you who have followed Google closely, that name may sound familiar to you because Google used the Pixel name in the past for consumer hardware products that represented an overall premium Google experience. 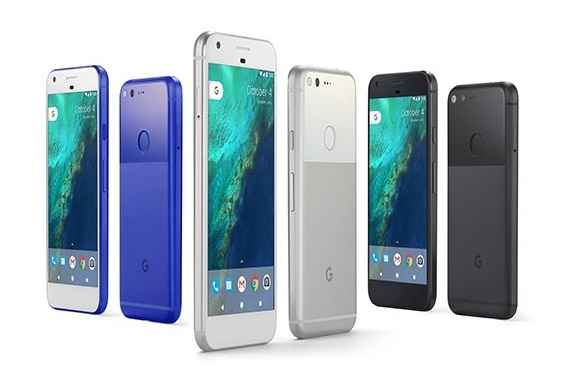 Googl's Pixel comes in two sizes, 5" or 5.5", and three colors: Very Silver, Quite Black and our limited edition for the U.S. only, Really Blue. And whatever you choose, Google got cases to match. In addition to customizing Live Cases with your favorite photos and places, Google also introducing a new Artworks collection that features exclusive designs from artists like Justin Maller, and photographers like Canadian astronaut Chris Hadfield. With Pixel, Google obsessed over every detail, from the industrial design to the user experience. Google carefully sculpted the surfaces of the phone, and rounded the edges to make it easy to grip and used 2.5D Corning Gorilla Glass 4 on the front display and back glass to accent the aerospace grade aluminum body. The glass on the back also features Pixel Imprint, and fingerprint sensor, which is placed on the back of the phone where your finger expects it. You can even swipe it to access your notifications. Pixel ships with the newest Android operating system, Android 7.1 Nougat. Phones will get software and security updates as soon as they're available, directly from Google. Google also made the update process easier. When a new update is available, it can download and install in the background - no more waiting around for your phone to update. Pixel has a 12.3MP camera, featuring an f/2.0 aperture and big 1.55 micron pixels to capture lots and lots of light. Pixel's camera lets you take stunning photos in low light, bright light or any light. Catch action shots as they happen with Smartburst, which takes a rapid-fire sequence of shots and automatically selects the best one. Use Lens Blur to achieve shallow depth of field and bokeh effects, making your subject pop. You can capture dramatic landscapes or make faces glow with new exposure controls. And as a special bonus for Pixel owners, Google including free unlimited storage for original quality photos and videos at full resolution in Google Photos. Pixel is the first phone with the Google Assistant built in. With your Assistant, you can have a natural conversation with Google to find answers or get things done on the go. Say "Ok Google" or touch and hold the Home button and your Assistant is ready to help. Ask it for a brief update on your day or to play a video on YouTube. Look up traffic on the way home from work or when the nearest pharmacy closes. You can even say "show me my camping photos with Andrew" and it'll instantly display the photos you're looking for. Your Assistant can also offer help with what's on-screen in any app. So if your friend texts you to meet up at a new restaurant, you can just say "navigate there". Pixel is available for pre-order today starting at $649 in the U.S., U.K., Canada, Germany and Australia. Pre-orders in India will begin October 13. In the U.S., Google teaming up exclusively with Verizon to make Pixel available nationwide at all Verizon retail outlets, including Best Buy stores. Google also offering Pixel unlocked on the Google Store and, for you Project Fi fans out there, you'll be happy to know that Pixel is the latest device to work on the Fi network.